If you haven't shopped vacuum cleaners lately, you may be surprised by the variety of options available. Not only can you choose between uprights and canisters, but your choices also include features for people with allergies and pets. The following guide will help you sort through all the jargon to determine which type and features are best for you. Full-size vacuum cleaners fall into two primary categories: uprights and canisters. Generally, uprights are better on deep pile carpets. If you have several different types of carpet, look for a model that can switch between low- and high-pile settings. Canisters are easier to push, pull and store, making them better suited for multi-level homes with stairs. They're also better at getting under furniture and hard to reach areas. 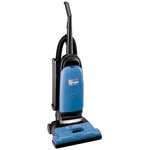 So choose a vacuum cleaner based on the types of surfaces in your home. But also keep in mind that vacuums vary a lot by weight and handling, so it's important to try before you buy. You want to be comfortable with an appliance you'll be pushing through your home several times a week. HEPA Filter: A HEPA (high-efficiency particulate air) filter captures a high percentage of dust and allergens and should be a minimum requirement if a member of your family suffers from asthma or allergies. Most manufacturers offer vacuums with HEPA filters, which are rated to capture 99.97 percent of dust and allergen particles, including pet dander, measuring 0.3 microns and larger (a human hair measures .1 micron, by comparison). Not all HEPA filters are created equal, though. A "true HEPA" filter is enclosed in a sealed frame, which ensures that fine particles won't bypass the filter and pass back into the room. Filters should be replaced at least every six months. Bag versus Bagless: Bagless vacs eliminate the need for replacement bags, which typically run $1-$3 each. The downside to bagless vacuums is the messy process of emptying the dust bin. Allergy sufferers should avoid bagless models. Power: Power is important, but nearly impossible to determine based on the information from the manufacturer. 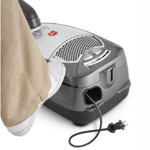 Manufacturers use different ratings to indicate the power of vacuum cleaners, which makes it difficult to directly compare the suction power of one vacuum to that of another. Some list amps, which tells you how much current a vacuum draws. Others use watts, air velocity or brush revolutions. If you have pets or a lot of ground-in dirt, power will be especially important. The only way to compare products is take them out for a test drive. 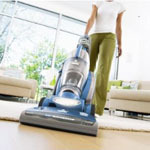 Attachments: At minimum, a full-size vacuum should come with dust, crevice and upholstery tools. An upholstery brush has small bristles that loosen hair, crumbs and dirt that are embedded in the fibers of upholstered furniture. A crevice tool has a tapered end that allows you to clean along baseboards, in corners, under the refrigerator and in other tight areas where a full size vacuum nozzle can't reach. A dust brush is soft enough for delicate cleaning: lamp shades, window sills and other scratchable surfaces. Many upright vacuums come with a stair cleaning tool. Specialized attachments not included in the standard vacuum cleaner package, but which we believe are all worth having, include slotted attachments used to clean blinds, curved attachments for cleaning ceiling fan blades and motorized brushes to clean pet. An extension wand adds several feet to your reach, allowing you get into wall corners and tall bookcases. Sensors: A full bag indicator is a worthwhile investment so you don't have to open the vacuum and check the bag frequently. Also, an indicator light showing it's time to change bags will help prolong the life of the vacuum and ensure you're getting the best possible suction. You should replace a filter according to manufacturer recommendations--typically every 4-6 months--so a filter status indicator isn't essential. Dirt sensors are overkill. You know when your carpet is clean or dirty. Ergonomic Handle: Manufacturers mean different things by "ergonomic" or "comfort" handles. Some are designed to reduce wrist strain; others refer to on-handle controls for suction level or height adjustment; still others refer to a soft handle material. Since height, hand size and strength all contribute to the vacuuming experience, experiment with various types before paying a premium for a model promising an ergonomic design. Low Operational Noise: Some manufacturers, such as Miele, promise noise output from their vacuums that can be 30 decibels quieter than other models thanks to acoustic foam around the motor. But manufacturers don't publish noise levels. So if low-noise is important, try before you buy, or purchase from an outlet, such as Allergy Buyers' Club, which has a 30-day return policy. Retractable Cord: You can get away with a shorter cord in a small apartment, but a 20-30-foot cord is essential in a large home to minimize how often you need to change power outlets while vacuuming. A retractable cord rewinds automatically so you don't have to wrap the cord manually. Revolving Brush: Also called brush agitator, motorized brush or power nozzle, the revolving brush dislodges dirt particles from the carpet so they can be picked up easily. A motorized brush gets deeper into upholstery and carpets than standard brushes. So stubborn pet hair and ground-in dirt benefit from the use of a revolving brush. If you'll be going from carpet to floor, get a vacuum with a fingertip switch to turn the revolving brush and off, so you can safely clean both surfaces without changing attachments. 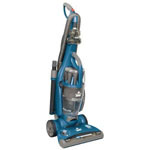 Not everyone needs the heavy-duty suction power of a full-featured upright or canister model vacuum. An entry-level model can be a cost-effective solution for a small apartment with thin carpeting or hardwood/tile floors. If you can forgo features like automatic cord rewind, pet brushes, sealed HEPA filters and edge cleaners, these cost-saving vacs can meet your needs. Eureka Optima 431($69) A lightweight (11-pound) upright with an on/off switch for the revolving brush for floor and carpet cleaning. A unique loop handle makes vacuuming under furniture easy. Great for small jobs. Electrolux Ergorapido 1012 ($99) A 5.6-pound two-in-one cordless stick vac with a detachable handvac built into the handle. Adjusts to easily go under furniture. 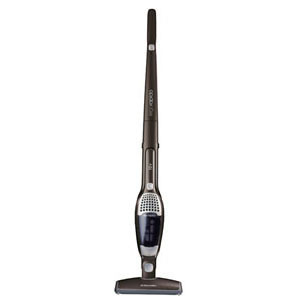 Hoover Tempo Widepath ($99) This 18-pound upright has five carpet-height settings; onboard crevice tool, dusting brush and extension wands and a wide 15-inch cleaning path. Mid-range vacuums give you the range, flexibility and features to handle complete home vacuuming tasks for a reasonable price. This range includes vacuums which are outfitted with the tools to handle both carpeting and bare floors. 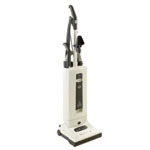 Step-up features in mid-range vacuums include fingertip controls for power, suction level and brush on/off, automatic cord rewind and adjustable height for different carpet types (for uprights). 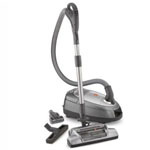 Bissell Healthy Home Bagless ($240) This upright has Microban, an antimicrobial agent, applied to key parts of the vacuum to fight germs and bacteria in the home, a sealed HEPA filter, seven carpet-height settings and fingertip controls. 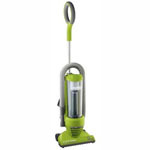 Eureka Boss SmartVac 4870MZ ($130) This upright features sealed HEPA filtration, a powered brush attachment, on/off brush control and seven carpet-height settings. 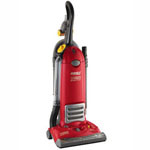 Hoover S3670 Anniversary WindTunnel ($299) This canister vacuum has a good combination of performance and convenience features for a large home including a 360° swivel hose for easy maneuvering, a 25-foot cord, HEPA filter and fingertip on/off controls to reduce the amount of bending required while operating. Shopping for a high-end vacuum cleaner is a bit like shopping for a luxury car. Many of the features may be the same as those found in lesser priced models, but the overall build, quality, durability and reputation of brands including Dyson, Miele, and Sebo have created loyal followers among their customer bases. At this level it's especially important to audition several models before buying, checking for suction power, handling, noise level and overall ease of use when changing attachments, bags and filters. Dyson DC17 Absolute Animal ($549) Dyson was the first to incorporate cyclonic technology, which separates dirt from sucked in air using cylinders operating in a high-speed spiral. This upright has a mini turbine head for snatching pet hair, and you can see from the clear bin when it's time to empty the contents. The vac automatically adjusts for optimum performance on all floor types, and its quick-draw telescoping wand helps you sweep stairs and hard-to reach places. Miele Callisto S5281 ($849) This canister vac packs in sound insulation for quiet operation, HEPA filtration and comes with a parquet floor brush and 10 1/2-inch wide electric-power brush for medium to high pile carpeting. 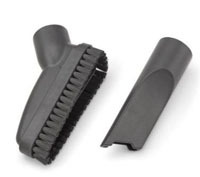 Attachments—natural bristle dusting brush, upholstery nozzle and crevice tool—store under the hood for easy access. 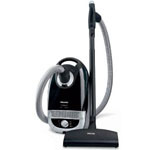 Sebo X-4 ($699) A sealable HEPA filtration system plus a sealable vacuum bag make sure no dust escapes once it’s captured by this upright. Other features include automatic carpet height adjustment and 180-degree operation. Pet hair and odor present an extra challenge for mothers trying to keep the home looking and smelling fresh. Vacuum cleaners designed for pet owners have features geared toward removing hair and dander that come under names including mini turbine head, Power Paw and others. A motorized brush is able to grab hair that ordinary upholstery brushes can't. Dyson DC17 Absolute Animal ($549) The Animal has a mini turbine head for snatching pet hair, and you can see from the clear bin when it's time to empty the contents. The vac automatically adjusts for optimum performance on all floor types, and its quick-draw telescoping wand helps you sweep stairs and hard-to reach places. Eureka Boss SmartVac Pet Lover 4870RZ ($199) Designed for the extra demands of pet households, The Eureka Boss has a turbo nozzle whose plastic teeth loosen pet hair and remove it from upholstery. A sealed HEPA filter keeps pet dander inside this bagless upright, and includes Arm & Hammer odor elimination for the dust cup filter. Allergy sufferers should opt for a bag vacuum with a sealed HEPA filter. HEPA-rated filters trap 99.97 percent of pet dander, pollen and other allergens. It's important for allergy suffers that the HEPA filter is a sealed type to prevent trapped allergens from being released back into the home. A micro-filter is also effective at minimizing the number of particles in the air. Miele Callisto S5281 ($849) A sealed HEPA filtration system with carbon filter plus a self-sealing bag ensure dust stays in the bag. This canister vac also packs in sound insulation for quiet operation and comes with a parquet floor brush and 10 1/2-inch wide electric-power brush for medium to high pile carpeting. Attachments—natural bristle dusting brush, upholstery nozzle and crevice tool—store under the hood for easy access. I consider it important to list the amps on vacuums. Excellent breakdown of vacuum cleaners. The amps do play a role somewhat. It doesn’t mean more amps means more power. There’s a lot more that goes with it. More amps does not necessarily mean more suction power or cleaning power. 1. The design of the motor. 2. The way the system filters dirt. 3. The height adjustment on the carpet/surface. 4. How you maintain your vacuum cleaner. Good to see some pet vacuums on there. The Dyson DC17 was a good one on your list, however many users seem to like the DC25 a little more. A good review overall though. 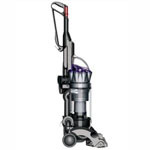 I am a professional carpet cleaner and I would recommend “Dyson DC17” its an absolute killer, because before wet cleaning I have to dry clean the carpet and I tell you the secrete after dry clean using Dyson DC17 carpet is completely dust free. I agree the Dyson DC17 has cleared many carpets for me without as much effort. good luck!